Hawaii’s state government has recklessly blown hundreds of millions of your dollars thanks to one of the worst run and most ill-conceived Obamacare exchanges in the entire country . . . and that more money will be wasted with the state legislature’s recent infusion of millions of dollars to keep the “Hawaii Health Connector” afloat. The Connector's first inept manager, Coral Andrews, resigned in disgrace earlier this year; it wasn’t long before her replacement, Abercrombie placeholder Tom Matsuda, found himself coming under intense scrutiny by a congressional committee regarding the mismanagement of taxpayer resources in the name of Obamacare. It is clear that Democrats have falsely promoted and unconstitutionally implemented this government takeover of healthcare. Now with the Hawaii Health Connector, Democrats are either incompetent in their management or are purposely practicing malfeasance in order to keep money flowing into their cronies. Unfortunately, several elected liberal Republicans in Hawaii played an equal role with Democrats in inflicting this financial disaster upon taxpayers. This raw deal has cost a fortune, falling very far short of performance expectations: nearly $200 million spent to sign up a mere 8,000 people. 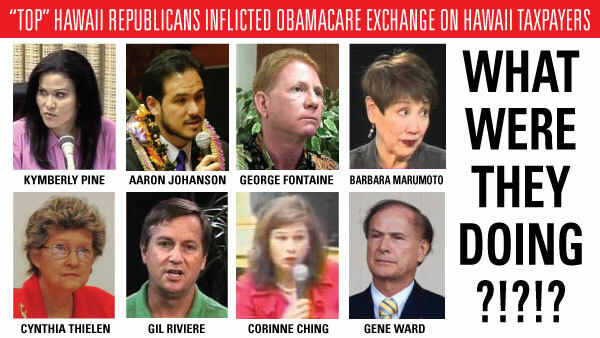 You'd think that Hawaii’s Republicans would have had the good common sense to vote against Hawaii’s Obamacare exchange. Doing so would have given island Republican candidates across the state the ultimate political weapon against Hawaii Democrats going into 2014; with conservatives being able to slam liberal Democrats for their grievous error of following Obama into the BIG government abyss. Instead, you hear nothing but the sounds of silence due to the abject complicity of leading Republican figures at the State Capitol who voted for Hawaii’s implementation of Obamacare in 2011. But how and why did local Republican leaders jump into bed with Democrats? While every single Republican in D.C. (both in the House and the Senate) had the good sense to vote against the deceptively named Affordable Care Act, Republicans here in Hawaii cast YES votes at the State Capitol along with ideologically symbiotic Democrats for Senate Bill 1348. 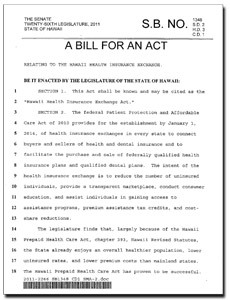 Abercrombie swiftly signed this terrible legislation which unleashed Act 205, thereby creating the Hawaii Health Connector. While conservative/libertarian Republican state senator Sam Slom predictably and laudably voted against this abomination, there was not one single Republican vote against SB1348 in the State House. That’s right, our elected Republicans voted unanimously FOR Obamacare in Hawaii. These so-called GOPers pushed Hawaii taxpayers onto a path which has already wasted hundreds of millions of tax dollars on the worst conceived and most poorly managed government program imaginable. This will be a hard pill for Republicans in the 50th State to swallow. So HOW could any local Republicans fall for the scam of Obamacare? Why would Cynthia Thielen think that bigger government would be a good idea as she cast her willing 'YES' vote for the terrible bill which created the Hawaii Connector? Why would Aaron Johanson eagerly waste taxpayer funds on a Ponzi scheme that their GOP colleagues in Washington had been warning over and over and over was a lie since Day One? There are many theories, but to support Obamacare, our local Republican state house members had to switch their brains completely into the off position, since only a handful of states nationwide were crazy enough to set up their own exchanges in the wake of the Affordable Care Act. Most states resisted the siren call of Obamacare and refused to set up costly exchanges. So who were these LIBERAL Republicans who misused their positions in the State House to inflict the wasteful Obamacare exchange on the people of Hawaii?? Kymberly Pine (former state house member currently on the Honolulu City Council), Cynthia Thielen (true liberal currently running for a 13th term in the State House), Aaron “Ling” Johanson (currently the Republican leader in the State House), George Fontaine (former state house member and currently the Maui GOP county chair), Corrine Ching (no longer in the State House since losing in the 2012 general election), Barbara Marumoto (former state house member and currently Charles Djou’s campaign manager for Congress), Gene Ward (current minority leader emeritus of the State House Republicans), and Gil Riviere (currently a turncoat running for State Senate as a Democrat). THE SOLUTION: These liberal Republicans owe it to our party, its members, and to the taxpayers of Hawaii to make up for their giant mistake by LEADING THE FIGHT to repeal Obamacare, here in Hawaii and nationally. It’s time for Republicans to LEAD; the elimination of Hawaii’s wasteful Obamacare exchange, the Hawaii Health Connector, is absolutely the right place to start. Stay tuned for Part II of HIRA's series "Hawaii Republicans Must Lead"